Advances in 1920s makeup played a significant role in defining a woman's beauty. Few will deny that the 1920s were the decade which ushered in modern fashion. Until the end of World War One, a woman's typical makeup routine was a powdered white face, black mascara on the eyes. Makeup before the 1920s was difficult to use, due to the fact products as we know them today hadn't been developed. Women would often make mascara at home with ash and India ink, or lampblack, then apply this concoction to their eyelashes. In the early years putting on makeup was, obviously, a more tedious process than it is today. For better or for worse, many societal factors played into the development of 1920s makeup and who wore it. 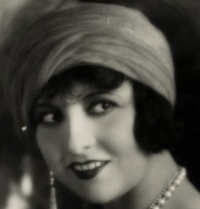 The female celebrities of the 1920s certainly had a lot to do with its popularity. Women in the movies wore makeup to accentuate their features "on screen," and then, as today, people looked to their favorite celebrities to define what was beautiful. With the development of the pharmaceutical industry and advancing marketing practices, the makeup market flourished (Like many products in the 1920s). Typically, before the mid 1910s, a refined woman did not wear lipstick. But as with the accentuated eyes, a woman's lips were defining feature of beauty and independance in the 1920s. Flappers were famous for applying lipstick in public, an act that would have been considered scandalous before the 1920s. Dark mascaras and eye liners to define a woman's eyes. Typically women would line the entire eye for maximum definition. Different shades of eye shadow (browns for eyebrows, blues, greens and teals for the eye lids and brow bones) to accentuate the famous "Flapper Look"
Lipstick in tubes. Various shades for the famous deep red "Cupid's Bow" (Heart-Shaped) lips. New beauty standards sprung quickly from the pale "Asian" look of the early 1920s, the garconne styles of 1925, and the femme fatale at the end of the decade. The rich colors of the era's paintings helped influence the colors of 1920s makeup and the sharp edges of 1920s hairstyles.